It’s no longer enough for American craft distillers to simply make ‘good’ whiskey. With so much competition, distillers are challenging the conventions of tradition and exploring new avenues of flavour creation for their whiskey. Jake Emen reports. As of August 2018, there were 1,835 active craft distilleries in the United States – a staggering figure that’s still quickly ascending. The sheer size of the industry doesn’t tell the complete story, though. Whisky-making distillers can’t all make a spicy rye Bourbon and still expect to successfully compete against one another, let alone against the big distilleries which have monstrous economies of scale and an existing customer base. ‘Innovation is important to keep you, and by extension, your brand, agile and creative,’ says Adam Spiegel, Sonoma Distilling Company’s founder and whisky maker. For many, the chance to start or run a distillery opens the door to following their passions and interests. So why would distillers position themselves for greater creativity in their work, only to copy what every big distillery has been doing this whole time? Spiegel takes an ingredient and flavour-driven approach to his whiskeys. ‘Distilling is a passion and creative outlet for me, allowing me and my team to experiment in ways meaningful to us and which are a reflection of our unique region here in Sonoma County wine country,’ he says. ‘As a home chef, I’m motivated by ingredients, flavours and the epicurean spirit around me – of finding new ways to incorporate whiskey into my cooking and discovering interesting twists on pairings. This is how my Black Truffle Rye whiskey came to be.’ Sonoma’s limited edition Black Truffle release quickly became legendary among whisky geeks. The truth is that in today’s craft distilling scene, it’s no longer enough to be ‘local’, or to stake a claim as the first distillery in a particular region. The whiskey that American craft producers are making must be good, but also different. Innovation and experimentation are vital, and this is reflected in everything from unique grains and distinctive types of smoke, to creative cask finishes. Of course, the big players are taking notice of all of this, too. ‘I think the big guys are definitely watching what is happening in the craft distilling arena, which continues to grow at an incredible pace,’ Spiegel says. Not that innovation is a new concept to them. For instance, Buffalo Trace has long been seen as an experimental wonderland and Woodford Reserve has released all types of limited edition releases incorporating many of the aforementioned concepts. To its credit, Jim Beam released its Harvest Bourbon collection back in 2015, which meant that as early as 2004 they were creating Bourbons incorporating grains such as brown rice, triticale and whole rolled oats. Some of the large distilleries have pursued innovation by acquiring or investing in notable craft distillers, while others are doing so by acquiring talent. ‘It’s pretty evident in their recruitment of craft distilling talent and brand acquisitions,’ Spiegel says. One of the most exciting and inventive ways in which craft distilleries are innovating is with smoke, often using on-site smoking operations to dry their barley. Sonoma is one such example, with Spiegel converting a shipping container into a grain-smoking compartment. Cherry wood also pops up with Chicago’s FEW Spirits, which uses it for its single malt, and Virginia’s Copper Fox distillery, which has a particular penchant for fruit woods, including both cherry and applewood. Owner Rick Wasmund uses a mixture of both in his eponymous Wasmund’s single malt, the barley for which is dried using his own floor malting operation, a skill he learned interning at Bowmore on Islay. A line-up of whiskeys are also now being made distinctively American with the robust barbecue aroma of mesquite wood. A trio of southwestern producers are leading the charge with their own single malts, including Sante Fe Spirits in New Mexico with its Colkegan whiskey, Ranger Creek Brewing & Distilling in San Antonio with Rimfire, and Arizona’s Del Bac distillery with its Dorado expression. The smoky sensations don’t stop there. There’s Texas scrub oak being used by Balcones for Brimstone, a corn whiskey [the distillate here is smoked using a proprietary process]; Arkansas’ Rock Town distillery’s hickory-smoked whiskey is made primarily from wheat, and Rough & Tumble is a hickory-smoked corn whiskey from Colorado’s Deerhammer distillery. Scotland doesn’t have exclusive rights to the world’s supply of peat, either. One of the key mission statements of Washington’s Westland distillery is to use Washington peat to smoke and malt its barley, which is also grown in the state. Bourbon is America’s core whiskey, rye roared all the way back from death’s doorstep to become a powerhouse, and single malts are now gaining serious traction. But nowadays there’s more to mashbills these three grains. Starting with Bourbon, a choice of rye or wheat in a three-grain mash bill has been the traditional choice. Now, four-grain Bourbons incorporating both can be found – the forthcoming Bourbon from Nevada estate distillery Frey Ranch is one to watch. 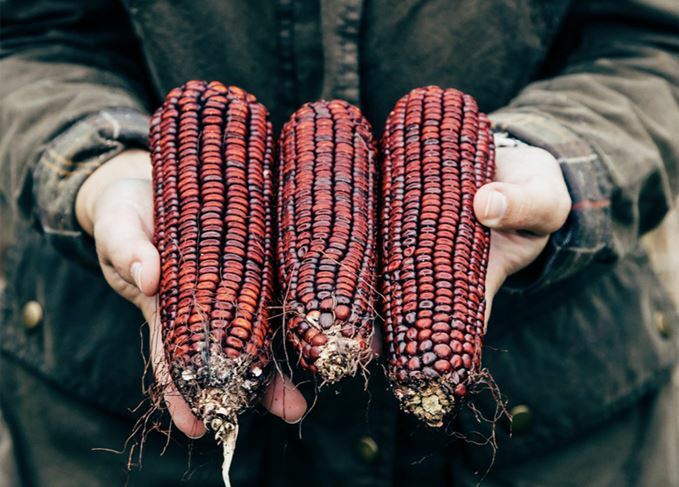 Heritage corn varieties are also being cultivated specifically for Bourbon production – High Wire Distilling in South Carolina used an endangered heritage corn in its limited edition Jimmy Red Bourbon, and Texas’ Firestone & Robertson Distilling Co. is researching the influence of terroir in corn and wheat varieties. Other alternative grains such as triticale, wheat, millet and oat are also being deployed in mash bills. Those grains have become the star of their own shows. Although 100% wheat whiskey is the most common, experimental mash bills have been used at Washington-based Dry Fly distillery, which has created a 100% triticale whiskey, while Chicago’s Koval has done 100% oat and 100% millet expressions. Beyond wheat, triticale is the most promising. A grain that’s a cross between rye and wheat, it incorporates some of the spice of the former and soft sweetness of the latter. Sonoma’s Spiegel also points to working with local growers and evaluating organic, GMO and non-GMO grains as other avenues of exploration. Another popular area of exploration is cask finishing, a technique not foreign to American whiskey, although it’s certainly less prominent than in Scotland. The standard charred new American oak barrel has long ruled the roost in the US, yet distillers are now getting ever-more creative and playing with more cask finishes. Collaborations between local breweries and distilleries have created a rise in beer barrel-finished whiskeys. The barrel is first used to mature whiskey, then sent to the brewery to age beer, before being returned to the distillery to ‘finish’ the whiskey. The beer and whiskey are then released in tandem and have become near-routine, expected offerings. There are, of course, always new lands to explore. Virginia Distillery Co. has released a well-received series of cider cask-finished whiskies, while Catoctin Creek, also in Virginia, has offered a limited edition of its Roundstone rye finished in a hickory syrup barrel. Nelson’s Green Brier distillery in Nashville already offers a triumvirate of Cognac, Sherry and Madeira-finished editions of its Belle Meade Bourbon, but in 2018 expanded its offering further with the Craftsman Cask Collection, putting ex-honey, Mourvèdre wine and Spanish brandy casks to use. Bainbridge Organic Distillers in Washington was able to source rare virgin Japanese mizunara oak for its Yama whiskey. Spiegel described Bainbridge as ‘...a small island distiller having fun, killing it and making some great product by experimenting with barrel types, unique mash bills and aging techniques’. Elsewhere, California’s St. George Spirits has never shied away from an innovative approach. The distillery’s annual Lot single malts are a masterclass on barrel maturation and finishing, incorporating rum casks, French oak wine casks, Port casks and Californian dessert wine casks, while its Baller single malt is aged in barrels that held the distillery’s own umeshu, a Japanese liqueur made with ume fruit. With over 1,800 American craft distilleries, all this innovation is assuredly just skimming the surface.